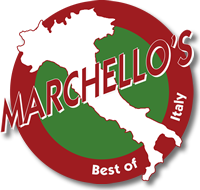 Using only the freshest ingredients, Marchello’s brings authentic Italian cuisine to Wichita, Kansas. Upon entering, you’ll be surrounded by the aroma of spices and home-style Italian food. Our homemade marinara, Alfredo, and Marsala sauces along with our homemade pizza crusts make our dishes one-of-a-kind. Our friendly staff will greet you as part of the family. Browse our extensive menu, but don’t hesitate to ask for the inside scoop for local favorite dishes. Be sure to inquire about our delivery services! We offer full catering services year-round for any occasion.